One Cancer Drug to Rule Them All? Written by: Manisit Das on March 22, 2018. As early as 1999, a scientific study in Denmark found that patients with Huntington’s disease (HD) are less likely to develop cancer when compared to their healthy relatives and the overall population. A decade later, another independent study looked into forty years of patients’ information from the Swedish Cancer Registry and identified a similarly low risk of cancer in patients with HD and related neurodegenerative diseases. Strikingly, this association was not limited to one specific type of cancer but applied to many different tumor types. What is the connection between cancer and these neurodegenerative diseases, which cause a progressive loss in the structure of the nerve cells? Researchers at Northwestern University think the answer to this puzzle lies in HD-associated ribonucleic acids (RNA), molecules responsible for important biological functions like expression and regulation of genes. An overabundance of repeated RNA sequences in HD can suppress genes crucial for the survival of nerve cells. A team of scientists led by senior author Dr. Marcus E. Peter at Northwestern recently discovered that these RNA sequences are also highly toxic to a broad variety of cancer cells, and thus have the potential to be a uniquely lethal weapon in the fight against cancer. All major forms of life on the earth use the nucleic acids like DNA and RNA to perform critical biological functions. 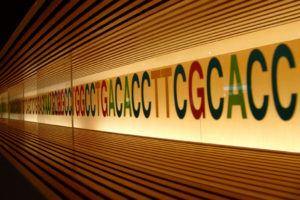 The nucleic acids are sequences of five basic building blocks called nucleobases, which are commonly represented by the Roman characters A, G, C, T, and U. Sequences in nucleic acids can encode information and direct functions in a living system. In HD, a defective genetic alteration causes a “stutter” in a gene called huntingtin, resulting in a prolonged stretch of triplet repeats of C-A-G. In the earlier phases of their study, Dr. Peter and his team tested a family of RNAs containing these CAG repeats in multiple human and mouse cancer cells. Within hours of treating the cells with the RNAs, the cancer cells stopped growing and eventually most of the cells died. Encouraged by these results, the researchers moved on to test the RNAs in a preclinical mouse model of ovarian cancer. They used small particles, known as nanoparticles, to enable better delivery of the RNAs to the tumor. The treatments were able to reduce the growth of the tumor and did not cause any prominent toxicity to the mouse. Further, the cancer cells were not observed to be resistant to the therapy even after multiple treatments. These “suicide” RNA molecules can be a breakthrough in cancer therapy. However, there’s a long journey ahead. The effect of the RNAs on normal cells is not quite clear yet. While a short-term therapy of a few weeks will probably not result in the neurological toxic effects of the repeated tri-unit RNAs, a transient therapy may not be adequate for long-term cancer remission. In fact, mice were observed to have a persistent tumor progression once the therapy was discontinued. Further, to achieve a robust tumor control, the mice had to be daily dosed with the RNAs for two to three weeks. The dosing can be a further delivery challenge in hard to penetrate solid tumors. Nevertheless, these issues can be addressed by rigorous optimization of the RNA formulations and using approaches like gene therapy to ensure long-term availability of the toxic RNAs in the tumor. Finally, it is rare to see a drug so effectively target so many different types of cancers, across species. Whether this is a “moonshot” against cancer, time will tell. Peer edited by Paige Bommarito and Laetitia Meyrueix. This entry was posted in Blog and tagged Cancer, Medicine, Science Communication Series by Manisit Das. Bookmark the permalink. Manisit Das is a 3rd year Ph.D. candidate in the Eshelman School of Pharmacy at UNC Chapel Hill. Manisit’s research focuses on adjusting the immune suppressed tumor environment in pancreatic cancer using nanoparticles for drug delivery. He is a Co-Organizer of ComSciCon Triangle, a workshop designed to empower STEM graduate students to communicate the concepts in their field and beyond to diverse audiences. When he is not in the lab, you can probably find him in the trails, admiring the diverse beauty of North Carolina. He has hiked in almost all of the 41 North Carolina State Parks.